Denny Hamlin and Kyle Busch will lead the field to the green flag. Regan Smith has dropped oil on the track ahead of the green. Smith heads to the pit lane as NASCAR does a little clean up. Green flag, Hamlin gets the jump on Kyle Busch at the line. He leads by a car length into turn one. Lap 19, Keselowski and Truex are battling for the 4th position. Keselowski clears him and drops to the bottom. He misses the bottom and pushes up the hill into Kyle Weatherman. Damage for the #2 but all cars continue. Lap 25, Harvick is climbing through the field. He started 12th, he’s now inside the top-5. Harvick looks to the inside of Martin Truex Jr and takes 4th. The championship 4 all run 2nd-5th, Hamlin continues to lead. Lap 36, Larson gets the green flag cycle started. Lap 37, Harvick, Busch and Hamlin head for the pit lane. Lap 38, Logano to the pits. Lap 39, Truex is the last of the championship 4 to pit. lap 42, Denny Hamlin cycles back to the lead. Harvick trails by less than a half second. Harvick is there. He has a run off turn two on the top. They split a lapper in turn three. Harvick takes the lead on the bottom. 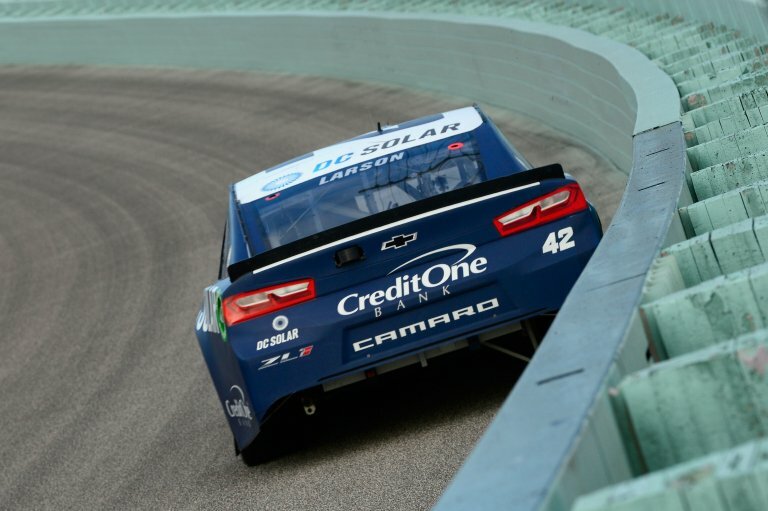 Lap 70, Kyle Larson is working the outside wall. Inches from the wall and moving to the front. Larson just picked off Busch for 2nd. Harvick leads Larson by 3.7 seconds. Kevin Harvick takes the win in stage 1! The field returns to the pit lane. Harvick is first in and first off. Green flag on stage two, Larson is clear of Harvick into turn one. 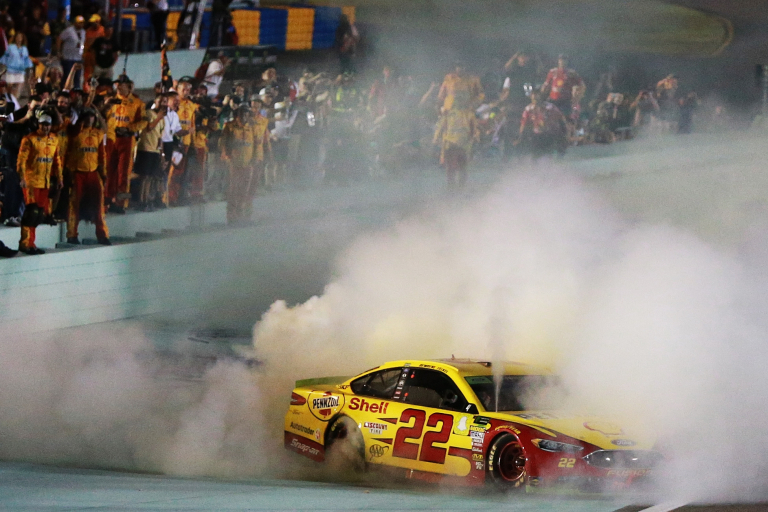 Logano follows him through to take 2nd from Harvick. Lap 90, Logano is on the bumper of Larson for the lead. Larson migrates to the top. Logano drops to the bottom, he’s clear off the corner. Harvick is closing, he retakes 2nd from Larson. It’s short lives, Larson has found speed once again against the wall. Larson back to 2nd. Lap 104, Larson is on the bumper of Logano. He’s got a run on the top. Logano lets him go. Larson returns to the lead. lap 118, Larson heads to the pit lane. Lap 120, Logano to the pit entry, he brings Busch with him. Lap 139, the caution is out for debris. It’s a piece of aluminum. The field returns to the pit lane. Larson is first in and first off. Harvick is at the pit exit in 2nd. Green, Truex is all over the bumper of Larson at the restart. The field stacks up. Harvick is on the gas through the middle. Harvick takes 2nd away from Truex as Larson leads out of turn two. Lap 148, from the top, Harvick has a run on Larson. He crosses to the bottom heading into turn one. Harvick is clear. He leaves the outside lane open for Larson. Harvick completes the pass on the bottom in turn three. 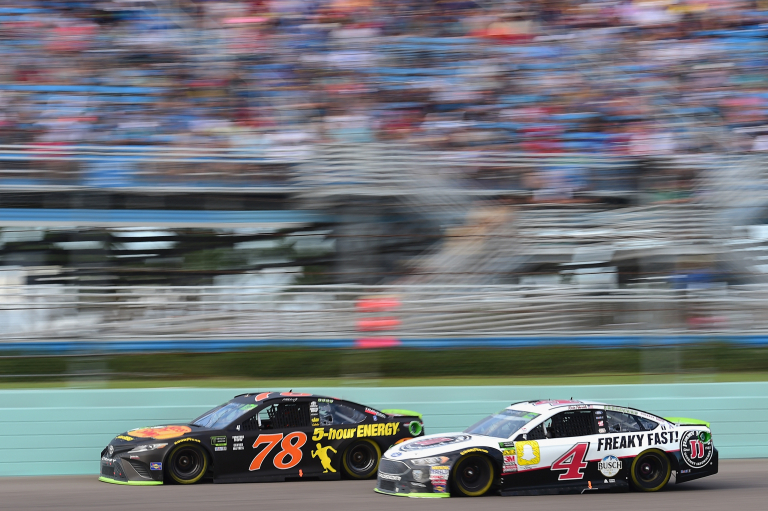 Final Lap in stage two, Larson has run on Harvick. 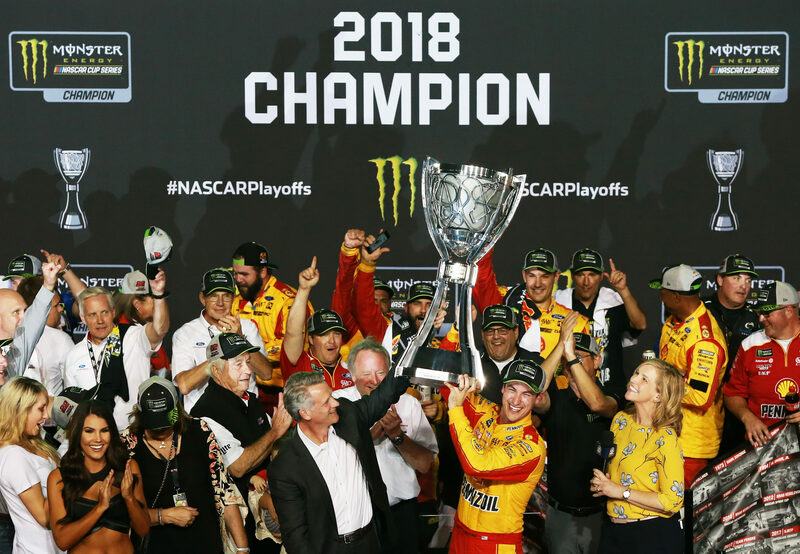 A stage win is big for Larson, for championship contender Kevin Harvick it means nothing. Harvick shuts the door off turn two. Larson is on his bumper all the way down the back stretch. Harvick to the bottom in turn three, Larson to the top. Larson pulls even. They run door to door off turn four. They drag race to the line, Harvick doesn’t try to side draft. Harvick doesn’t fight him as Larson takes the win in stage two! The field returns to the pits for fresh tires. Harvick is first in and Logano is off first! Green flag on the final stage, Harvick to the bottom. Logano is hanging on his right rear into the corner. Logano loses the nose and he washes up the hill. Harvick shuts the door and leads off turn two. Harvick picks the middle. Logano to the bottom! They run even off turn two once again. Logano pulls all the way to the inside of the track, he’s driving away from a possible side draft. Logano is clear into turn three. Truex moves to 2nd. 78 to go, Larson had a long run car. Once the tires wear off, he finds pace against the outside wall. They run right by him on a short run. Then, he runs them back down in a long run. It’s a see-saw. Larson takes 2nd away from Truex. Logano leads by just under a second. Larson is in trouble! He pancaked the wall a lap earlier. Now, he has a flat right rear. The caution is out. The field heads to the crews on pit lane. Logano is first in and first off. The air hose gets caught as the crew crosses sides for Kyle Busch. Another slow stop for the #18. Kyle Busch will restart in 8th! Green flag, Logano and Truex are even heading into turn one. Truex pinches him toward the wall on entry to get as wide an apex as possible. Truex to the bottom, Logano through the middle. They bangs doors off turn two! Busch is moving quick around the top. He picks off multiple cars in turn one. They remain side by side for the lead up front. Truex is working the side draft. Logano finally confirms the lead. 51 to go, Truex has caught the leader. Truex looks to the inside. Logano gets loose through the middle. He chases up the hill and they run side by side off the corner. Truex is aggressively side drafting. Logano to the middle. Truex gases it right to his bumper. He’s trying to take the air off his spoiler. Truex to the inside off the corner once again. He drives it deep to the bottom, he slides up the hill, clear. 37 to go, Harvick heads to the pit lane under green. 36 to go, Truex and Logano head to the pit lane. Slow stop for Truex, Logano beats him to the pit exit. Logano comes off the pit lane and Harvick is hard on the gas off turn two. This will be the race for the lead and the championship. Harvick pitted a lap early, it’s put him in what will soon be the lead. 33 to go, Logano is all over Harvick. Right now, this is the race for 4th. Harvick holds him off for now. Busch has yet to pit, he can’t make it on fuel. This is a hail mary from crew chief Adam Stevens. 20 to go, Suarez is four wide with Brad Keselowski. He gets tagged and the caution is out! That hail mary pass is complete for Kyle Busch! Kyle Busch leads the field to the pit lane. He’s first to the pit exit! Truex is off in 2nd. It’s going to be a short 15 lap shootout. The championship 4 run 1st-4th. Green flag, Truex Jr gets a jump. He leads by half a car length into turn one. Busch lifts and Truex is clear off turn two. Logano quickly works by Busch. Coming to 12 to go, Logano has a run off turn four. Logano drives it deep on the outside into turn one. They’re even at the center. Logano is clear off turn two! 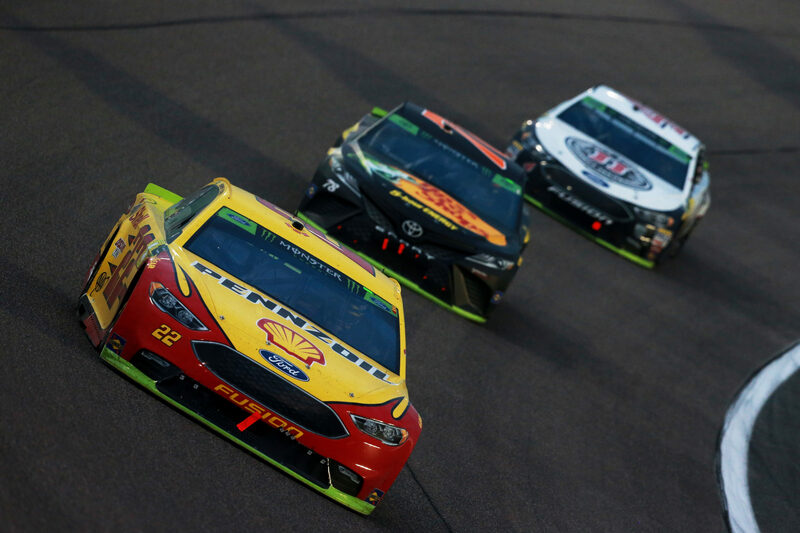 5 to go, Joey Logano is pulling away from the field. Joey Logano wins the race at Homestead-Miami Speedway! He’s also the 2018 NASCAR Champion! 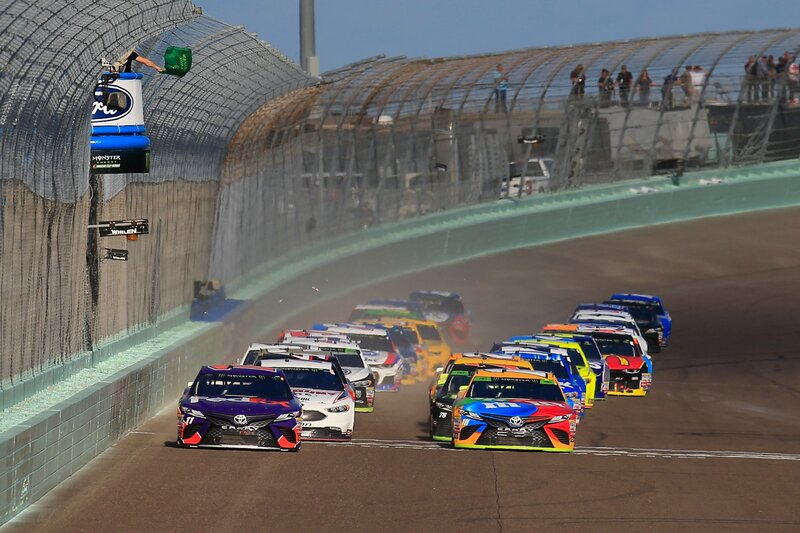 View full Monster Energy NASCAR Cup Series results from Homestead-Miami Speedway. Additionally, the championship 4 results are listed as well.